Spring cleaning was late this year, as the women’s attention had been given over to family illness. The kitchen had been repainted some weeks earlier, but other rooms hadn’t been dealt with. Evelina set out to rectify the delay and, probably with support from Jane McHanna, donned her apron to tackle the best room in the house, the parlor, much of which had been redecorated back in February, so needed little attention beyond its windows and a basic cleaning. One imagines Evelina and Jane in working clothes as they went about with their brushes, rags and mops. But what did Evelina wear under her apron, or after she changed out of her choring dress? Was she wearing any mourning attire? Did her outfit signify at all the recent loss of her nephew George? In the 19th century, “[m]ourning was particularly a woman’s affair,”* perhaps because of a societal norm that women were sentimental and emotional, and men were not. There were rules about attire to be followed after the loss of a loved one. 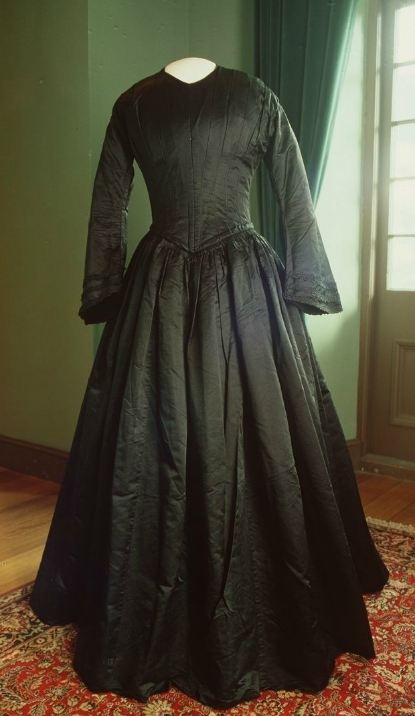 At the beginning, black crepe dresses, black veils or headgear, and even black jewelry – onyx, usually, or pins netted with a lock of hair of the departed – were expected to be displayed in some manner. After a certain period, black was put away and lavender, grey or purple dresses were acceptable. The closer the relative was to the deceased, the more exacting the expectation. By these calculations, Sarah Ames Witherell had been dressed in black or lavender too often before. Her husband had died in August, 1848, her young son Channing in May, 1849 and now her son George. Sad to say, she would have had a black dress or two, plus the appropriate accessories, in her cupboard. But what was Evelina obliged to wear? Perhaps not a black dress – although she had one – but an armband? Or a black ribbon in her bonnet? What was the expectation for an aunt?